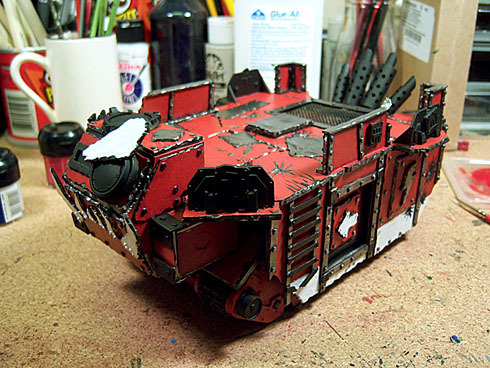 by sukigod on August, 10, 2008 in Heavy Support, Scratchbuilt Battlewagon - Comments Off on Deff Rolla Rocks! Deff rolla rocks. I’ve actually taken photos during each step of the finishing of the roller. 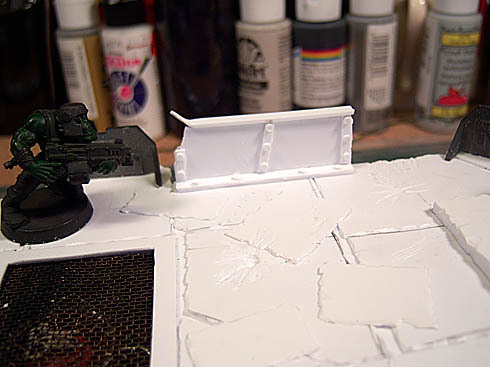 The plates started off with with a primer black base. 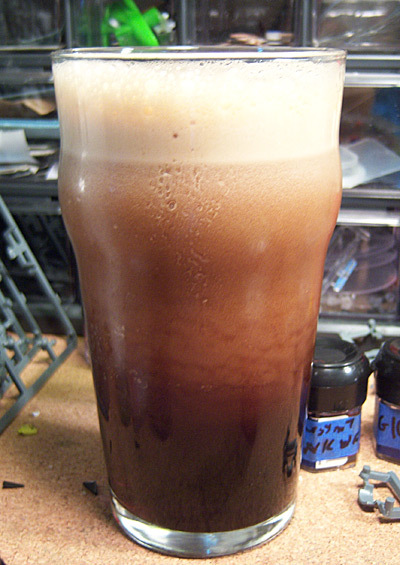 For the first two layers I used a wet version of dry brushing. The brush was wet and paint had been thinned down as normal, only I brushed the colors over tops of everything in very broad and almost all encompassing strokes. 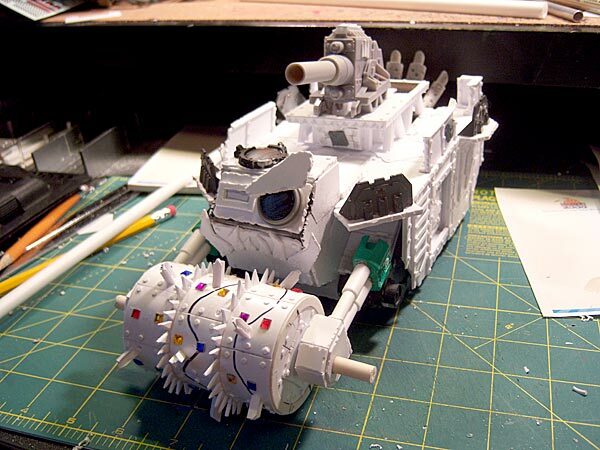 IN ORDER: Tin Bits, Straight Boltgun Metal, hightlights with Chainmail. IN ORDER: Mithril on highest highest parts and outlined edges and edges of spikes to give depth/dimension, first “magic wash” with black, second “magic wash” with Chestnut Ink. 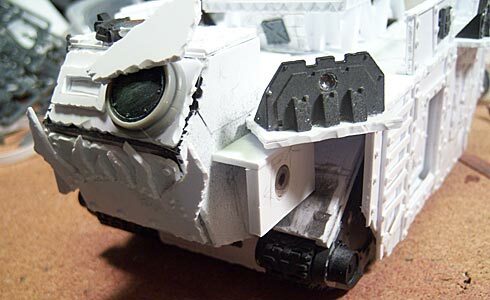 The Mithril might seem, at first glance, to be a bit bright for an orky vehicle but my experience with washing and sealing with a matte spray (Testors Dullcote) one needs to bring your highlights up at least on or two levels higher than you think since the spray will knock back high spots considerably. Here it is with the roller in place, I’ve already painted to the arms to match. 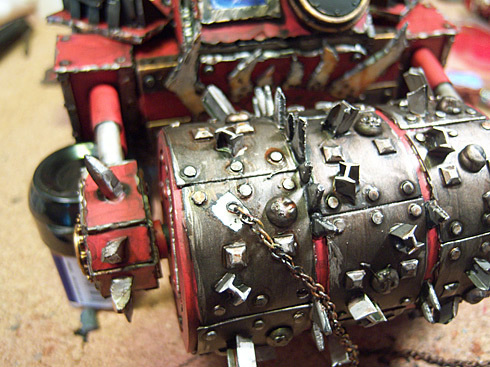 The rusted chain is your standard hobby jewelry chain primed black, wet brushed with Dark Flesh, Vermin Brown and then sparsely washed with Fiery Orange. After test fitting the chain (meaning “wrapping it around ten different times”) I found where I wanted it to start and end. I prepped the start/end points by scraping away a small spot down to the bare plastic so the glue holds well. I glued one end in place, wrapped the chain and glued the other end. The chain is spot glued down in a few areas to keep the chain from slipping too much and coming loose or slipping over the spikes and comming loose. I then used a short piece of tubing cut vertically to create two end covers to protect the bolts that adhere the chain. At least thats by excuse – in reality it just covers the ugly glue down. 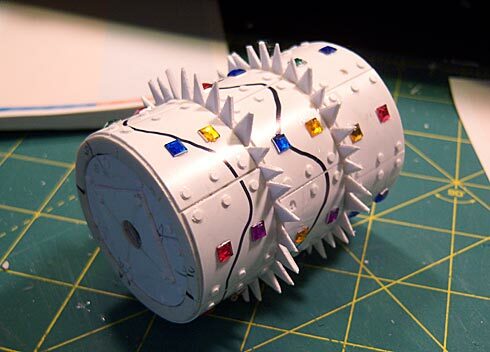 Here’s the wrapped and painted roller. The boyz got so excited at this point they just had to take the thing out for a ride. Mighty purdy dey iz! 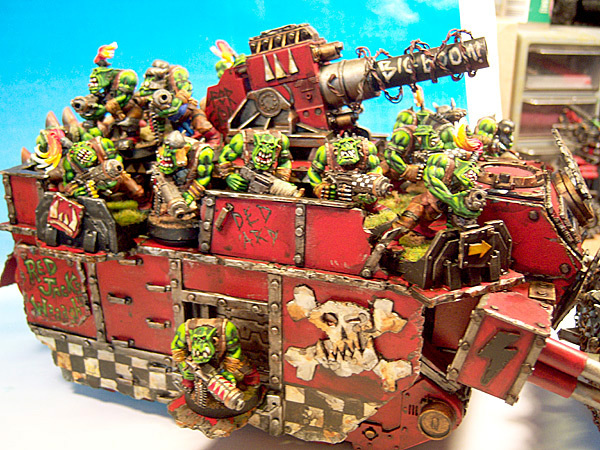 And yes, as per the 2nd Edition rules, it will hold 20 boyz. 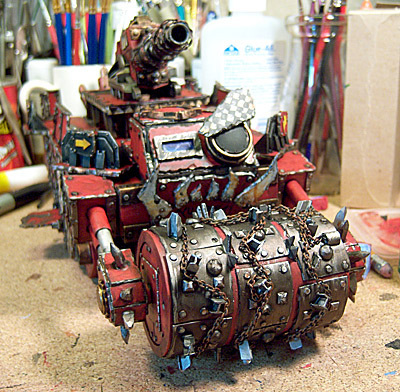 I’ve got a few things to finish off before calling it complete – paint the spotlight “eye”, paint the lighting bolts on the roller arms and finish painting the bolt-on big shootas. All in all, I should be finished with it this week. Ok, remember that deff rolla that went south on me a couple months back? Well, I finally forced myself to fix it. I had to as it’s nearly the only thing left to finish! As you can see above, on top of supergluing the plates in place, I’ve screwed them down as well. 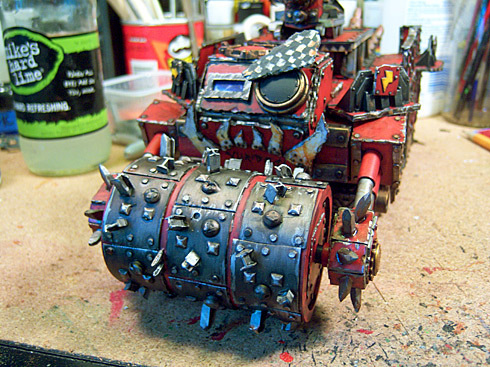 Inelegant as that may seem, it’s the orky thing to do (I’m also all out of miniature duct tape). These plates will not be falling off any time soon. 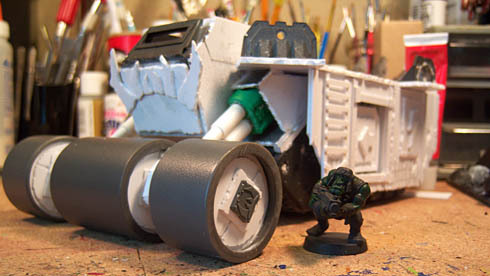 After some primer and some base painting red, here’s a scale comparison shot next to the boyz trukk. Nice! My favorite shot of the day is this one – reward for tackling the rolla. Here’s where it stands. I’m out for a week, see ya then. I know this isn’t what you guys would want to see in an update but it’s where I’m at. Things are slow going since it’s summer (finally) here in the northern US, although I did get a chance to sit down and start slapping some more paint down. I’ve gotten a majority of the red areas blocked out and done. Blocked in white where I’ll be doing checkers with a micropen. Started base painting the metallic areas with black/bolt gun mix going up through bolt gun. 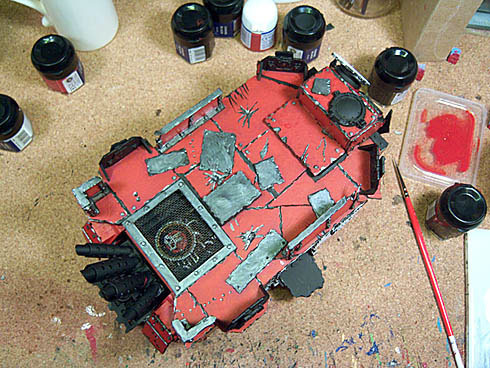 The reds are the standard GW progression, the scab red applied with a brush (over the Mecharite Foundation) and put the rest on with a sponge technique as to enhance dirty/worn out effect, but I didn’t go all the way through the blood red as I’ll save that for the highlighting after weathering. 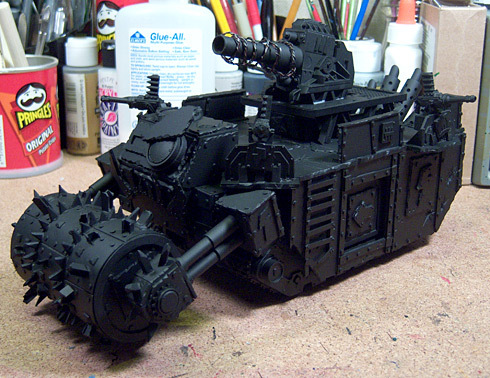 This is my thought process for painting this beast. I’ll paint it in somewhat “new” condition and not worry so much about painting in all the dirty and grime early. The paint job will be “fresh” and then I’ll grease/grime/rust it up so all the underlying paint is actually under the crud. When that’s all said and done I’ll go back and do any highlighting and bringing the colors up to where I need them before sealing it. The deff roller is in sad shape as you can see below. The glue I used didn’t quite take enough so the plates are falling off. 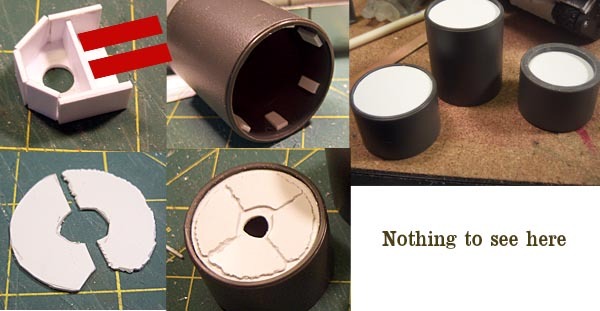 I’ll most likely remove them all, scratch the pvc pipe up real good, maybe even drill small holes for the epoxy (which is what I’ll use next time to hold onto. Lessen learned. 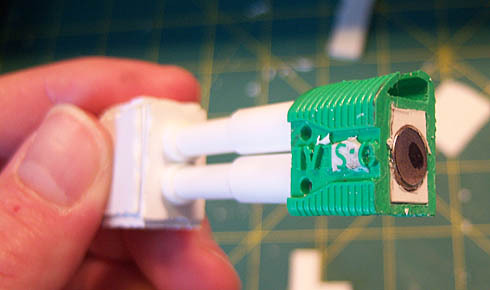 Regular model glue doesn’t hold to pvc. 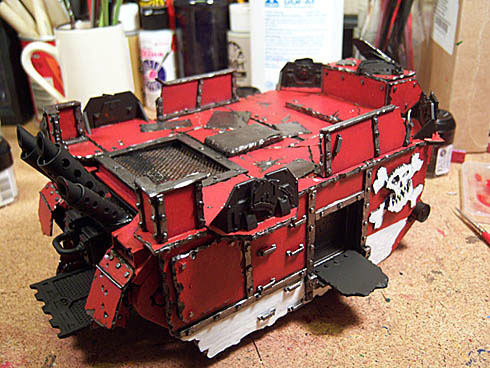 by sukigod on May, 12, 2008 in Heavy Support, Scratchbuilt Battlewagon - Comments Off on Begin the Bedazzler! How’s this for motivation? 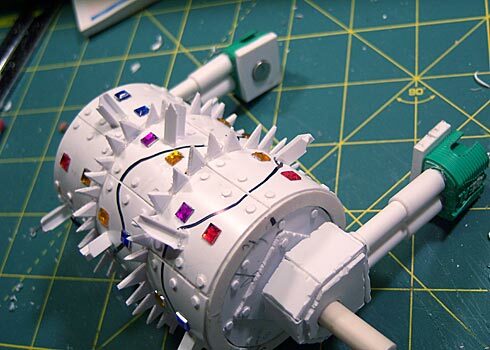 My wife walks into the office, I’m hunched over the workbench sanding some spikey bits. She takes a look at the deff roller and remarks.. 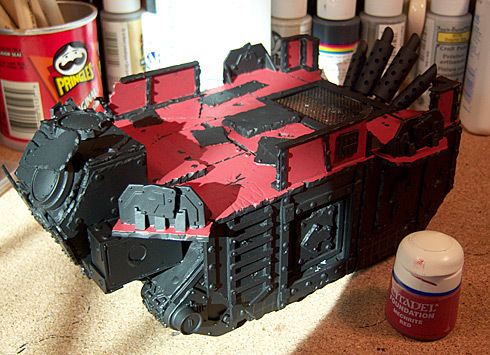 I finished off the other details areas that need to be done before painting. there’s a bunch of other little things like barbed wire, grots and bits I can put on later. I don’t mind scraping a little paint for gluing. On to painting! 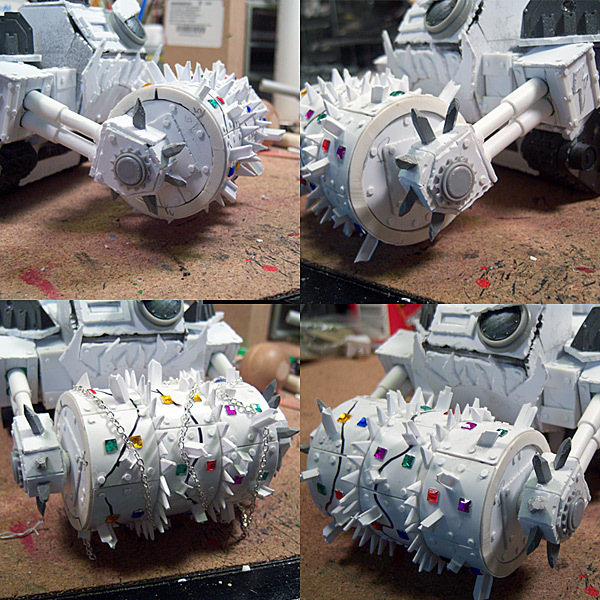 After primering up what I thought was enough chain, I looked at the pics and figured I could use a lot more chain on that roller. Here I’ve started blocking sections out with Mechrite Red. OK, let’s get this out of your system right away. Pretty eh? 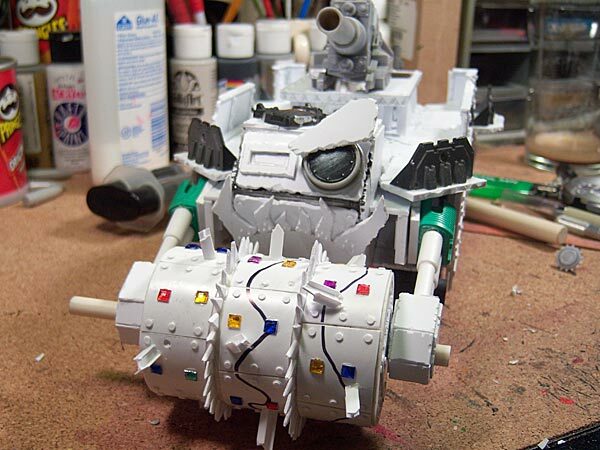 Nice shiny Eldar like jewels encrusting that new Deff Rolla? Hahahaha lol lol lol You’ll be laughing when dem gems are crushing all yourz skulls inta bloody pulps!!! Mash. mash, MASH! I myself will have a hard time taking this thing with any seriousness until I primer it. Now let me explain… I’ve been wrestling with how to pull off the shallower, pyramid like spikes on the deff roller. (I started to assemble some bikes while I was hatching my ideas) I don’t have the materials/skills right now to mold my own, although I might look into adding that ability in the future. I though a lot about MonkFish’s suggestion about the studded belt pyramids and after looking at them, I couldn’t find ones small enough. 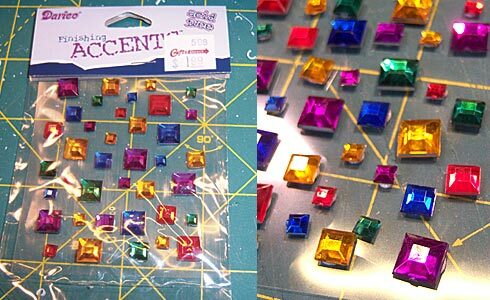 I spent lunch yesterday at the local mega-craft store and the closest I found were these. I-beam mincers to chew things up more. I’ll be adding some chain wrapped around the roller as well – I think that’ll be enough detail to keep da enemy mesmorized enough while I crush’em good. 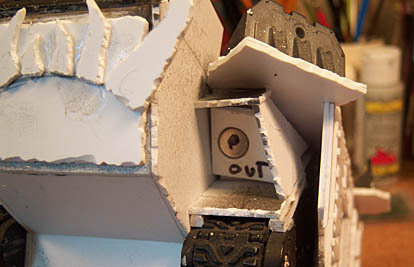 With the roller work almomst done, I moved on to fixing the end arms/attachment points. 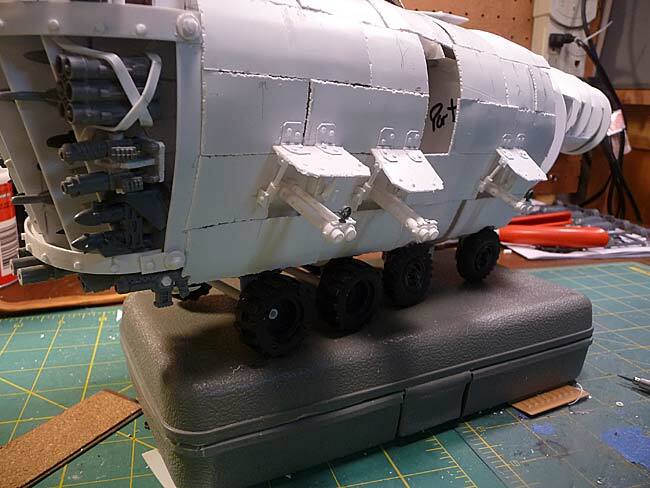 I moved the magnets to the sides of the struts and started building boxes aside the drivers compartment to meet them. I’ll built new housings around the green parts too as they just aren’t quite what I envisioned, not junky looking enough! Aaaand here’s how it sits now with the roller attached. 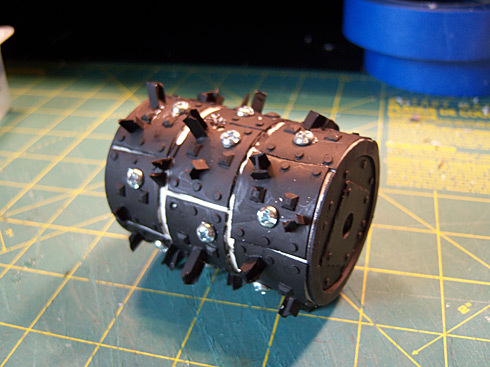 I need to finish off the attachment points for both contact points, cap the ends of the roller axles, battle damage the roller surface and add some spiky/knifey bits to the ends of the roller. THEN I can force myself to finish the drivers compartment. Whew! Did I mention I started those bikes? 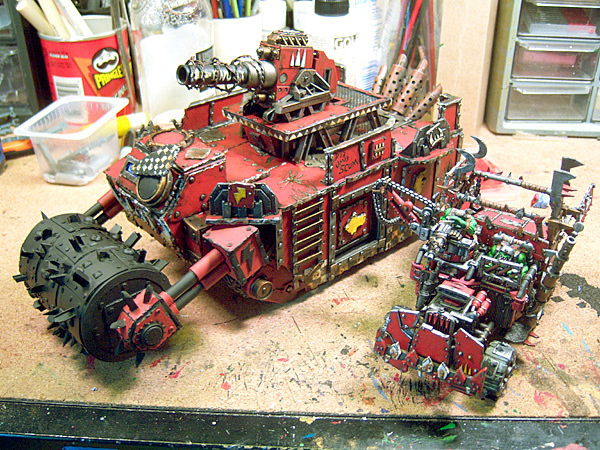 by sukigod on May, 02, 2008 in Heavy Support, Scratchbuilt Battlewagon - Comments Off on Spikey Deff Rolla! Quick post. I put in an hour last night. One hour. An entire hour. And produced this. 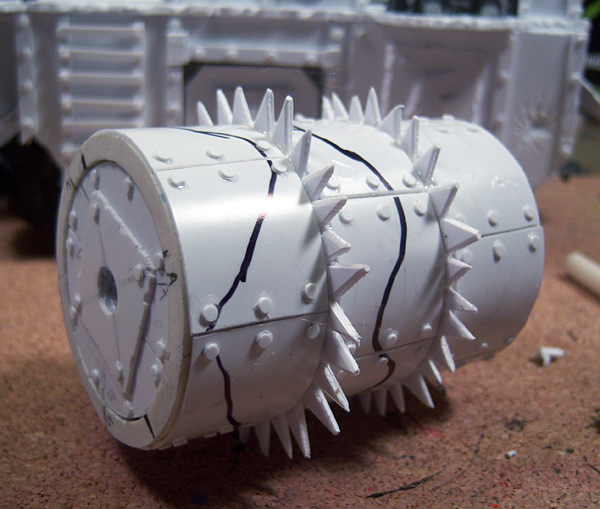 I’m trying to figure out the easiest way to make the wider, flatter pyramid spikes that should adorn the roller plates. Thanks for all the ideas and suggestions! I wish there was a grot manufacturer in the area. 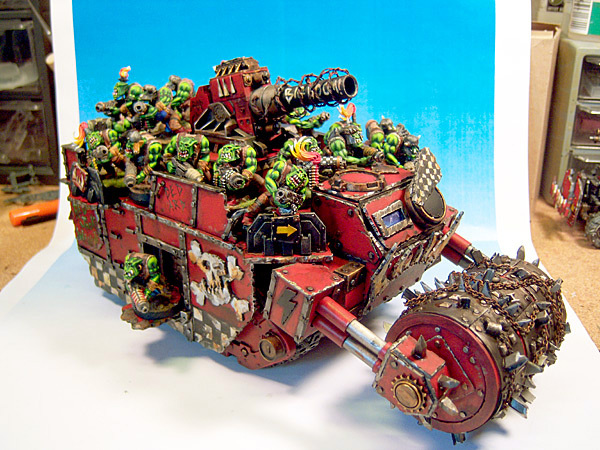 I’ve got a ton of grots but not the really dynamic ones (flattened, crawling, etc.) and I don’t have the funds to ebay willy nilly at the moment so I’ll keep these in mind and try to get a hold of them in the future to add to the character if this beast. The nice thing about working on something so large is if I get bored/frustrated/uninspired with one thing, I can always pick another part to work on until inspiration strikes again! 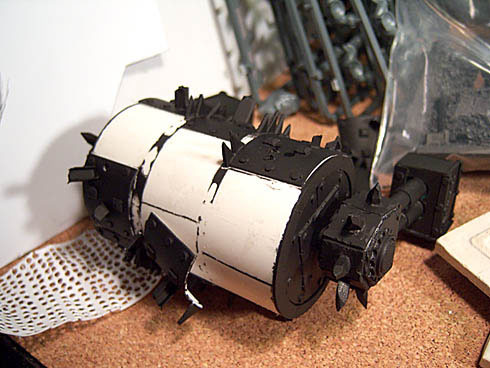 The mechanicals for the deff roller is done, it rolls and is removable. The photos below show the particulars and where/how it attaches. 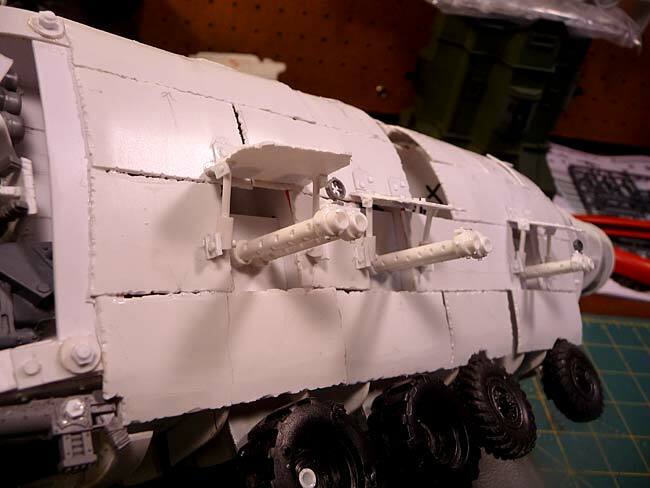 I know that I’ll be putting on plates, spikey bits and rivets, I just haven’t the image in my mind of what they should look like yet soooo….. I’ll move in to the upper deck and the railings. Before I show how that*’s going, I want to show you my latest find. TADAH! 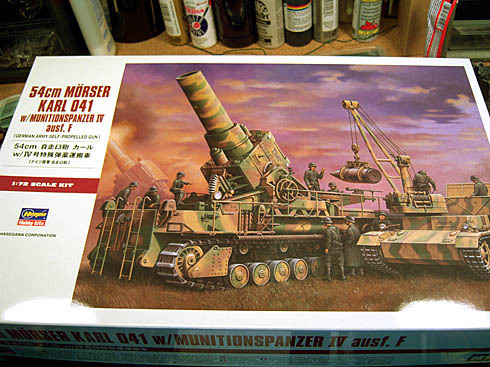 This is a 1:72 giant German gun. 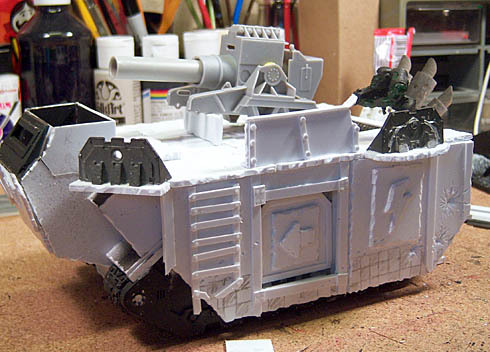 In regular 1:32/35 scale this would be way too big for something of the scale I need for a battlewagon (Gargant, yes), but in 1:72 it fits perfectly as my Kill Kannon. I sticky tacked it together to show the scale and general placement for the gun. 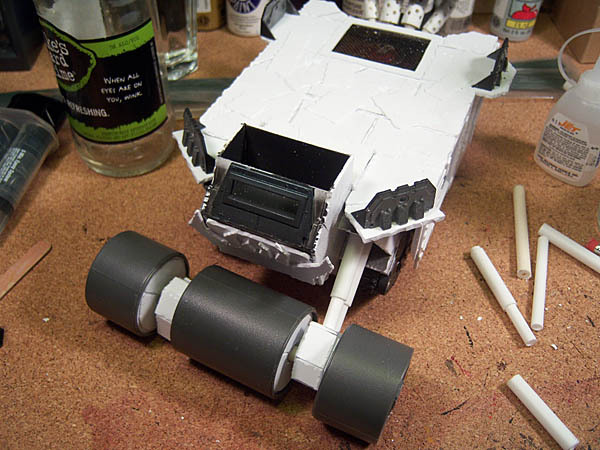 Since it will be magnetized I can also use it as a Boom Gun on regular looted wagon. Two weapons in one! 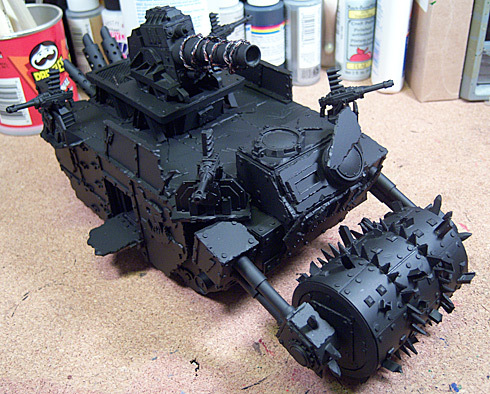 The extra bits I’m not using for this build should yield me an extra looted wagon/truck combo and or a buggy as the smaller scale Panzer Ammo Carrier frame is too small to become a full fledged tank on it’s own and I think I might use the base for a rokkit buggy. Who knows? In the pics for the placement of the big gun is the first of the railings I’ll be putting up to keep the boyz from falling off. The last pic shows the inside detail. 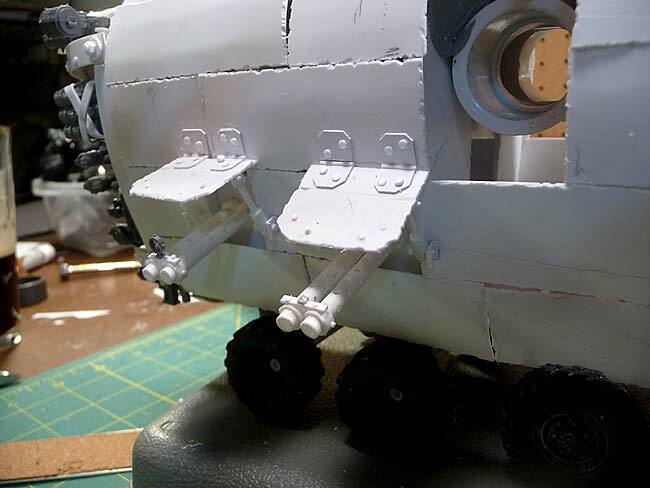 Oh yeah, there’s some rivets too! 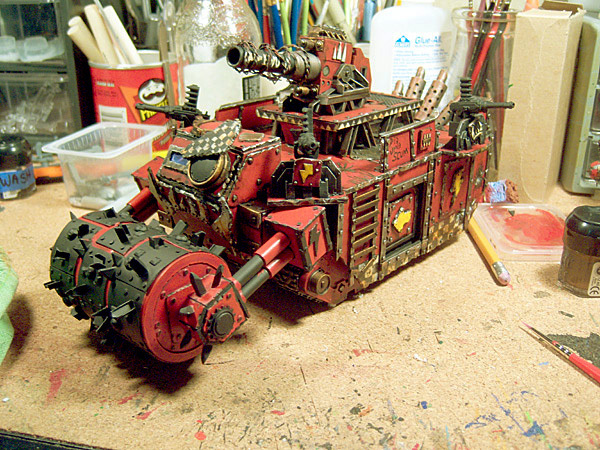 I picked up a leather punch and found out how dedicated one must be to make the hundreds of rivets that adorn all the orky vehicles out there. Whew! Made some progress over the weekend on the deff roller and had a little mini-vacation with the missus! Overall, a good weekend. 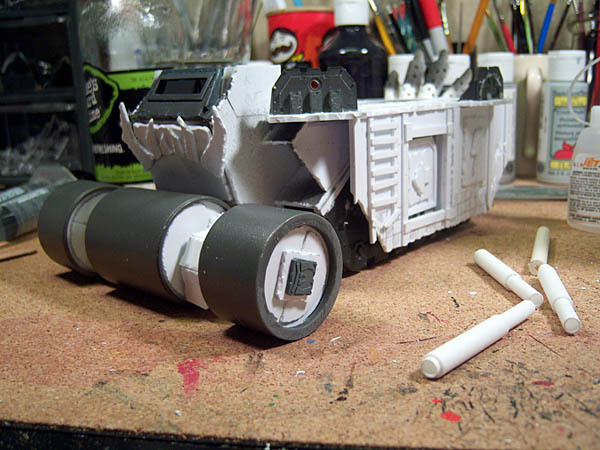 The first pic today is a composite showing some in process while making the rollers themselves. The first inset is the armature end that connects the rollers to the connecting arms. The red bars show where the rods will stop up against the plastic card inside to give it more stability and strength. 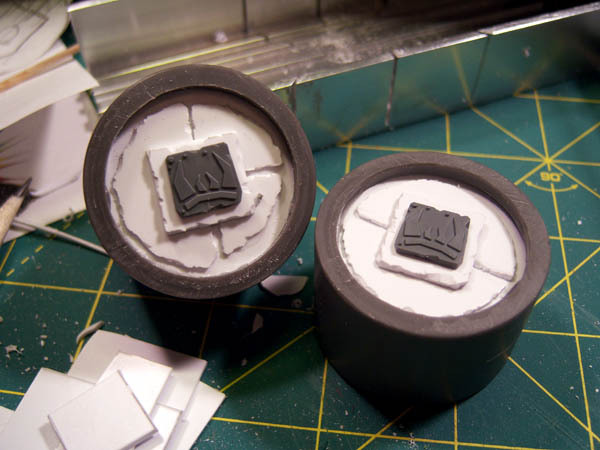 The others are the rollers, capped, and then the detail plates and capper glyphs for the end of the outside rollers. 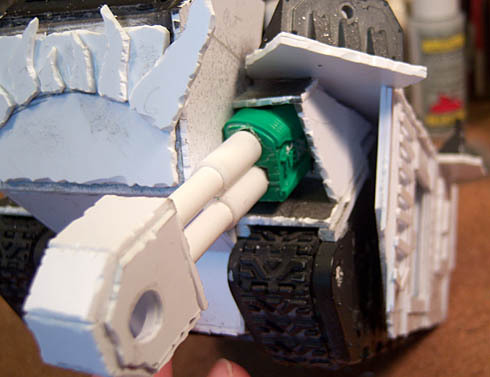 The last couple are the model shown with the roller in place to see how it fits. I’ll have to shorten up the connecting arms and I’m still trying to work out how I want the ends to look, the parts that go up into the body. I’ll have to hide a couple of magnets too so I\’m going around and around in my head on how to do that.